Levi's squad faces the Military Police in trying to secure Eren and Historia. Secrets from the immediate past come to light. Did you hear what Kenny called Levi? "Levi Ackermann." Ackermann! Like Mikasa Ackermann! We had never heard Levi called anything other than Captain Levi, but then this serial killer who raised the orphan Levi knew his full name. Let's just casually drop that bomb in the middle of the show with all the other bombs about what is going on behind the scenes in the Walled City and who is in charge. We are definitely in the middle of a third narrative arc because that means it's time to explore origins. 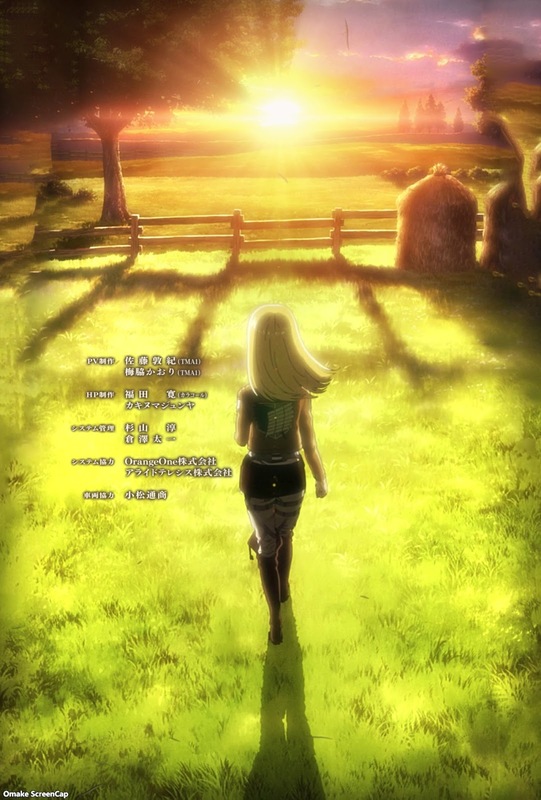 The opening credits allude to a lot of the main characters' pasts as they grew up, including scenes of Erwin, Levi, and Historia. Historia Reiss, and her family, are supposed to be the actual ruling nobles, so her back story of an illegitimate child being removed to a backwater village has darker roots and explains the cult of priests who took her too and how Historia met Ymir. Levi's origins are probably going to be just as compelling. If Historia gets a connection to the throne, the Ackermann name is going to get something else as grand. Seeing how Mikasa and Levi are amazing athletes and warriors, I'm expecting some kind of warrior clan back story. Will those two acknowledge their family ties? This is all getting interesting. Continuing on with last week's thematic imagery of guns vs blades, we're seeing a nice connection to themes of killing other people, the morality of taking a life, and whether war can justify such actions. It's a seminal scene to see Armin's first killing of a human was done with a gun, further cementing the dichotomy of which weapons are used to kill which monsters. Levi's take on what Armin is going through is very pragmatic and very blunt. No coddling, no worrying about emotions, and there wasn't even an attempt justifying its moral correctness. Armin killed someone else because they weren't on the same team, and his team needed to win. He saved Jean's life, but whether what they're doing, isolating Eren and Historia from the Kingdom to find out what the mystery of the Titans is all about, even justifies self-defense is an open-ended issue. So, this is all good. Plus, the action is top-notch because we finally get to see Levi fly again, and it's tied to a Master vs Pupil dynamic. Pile on the emotional tension! Yeah! Maneuver Gear fight in the city! Guns vs. Blades. Who you got?! Tranquilizer darts. They need Eren and Historia alive. Ha! Everyone knows Captain Levi. Welcome to the saloon. Poor sausage guy. Can't a man eat his sausage in peace without a bunch of guys jumping into the bar? This is such a Western standoff. Reflection in a wine bottle, stalling for time behind a bar, blam! Pure action stuff! Human shield to block bullets! Mikasa gets it. Time to go! Kenny's assistant is gold. I like her. Erwin in exile. He sees the bigger picture, "This little world is going to change." Perhaps that's what all this secret military police action is all about. To prevent that change. Dammit, Jean. You should have kicked the lady out of the cart instead of trying to hold her with a threatening blade. Armin had to kill for you. And they lost Eren and Historia. Armin puked. Understandable. Levi's debriefing is quick and blunt. No wonder he gets such respect for his leadership skills too. They need to get Eren and Historia back, so it's time for good old extortion, heisting, and torture. Ha! This interrogation scene is textbook. Not the torture part, but letting the MP see his partner betray him. Lots of political bombshells here. Making an illegitimate heir disappear, killing a professor who found out too much, shooting down people who wanted to fly. This ties back into the first scene of the season with Eren at the beach. It makes me think the Kingdom and the lands around it are on an island and everyone on it is a prisoner. We got end credits and a theme song. Historia is the star, apparently. Next time, we deal with Historia reunited with her real father, the real heir to the kingdom, and Erwin gets an origin story too. That bearded teacher looked like the one to which the tortured MP referred.